We Love to Talk! Free Consultation with our Experts. Development is complicated, getting a quote shouldn't be. Let us help you! Everything You Need to Start Your Online Store Today! We design and build user-friendly E-Commerce Websites that look fantastic on every device, are secure, easy to update and inclusive of all the functions you need to manage your products, pricing, customers, invoicing and much more. Start an Online Shop to Showcase and Sell your Products in the Best Way Possible!  We’re a London based E-commerce Web Development Company designing easy to use E-Commerce Websites that'll take your business to the next level. We make everything simple for you, from ordering products, creating invoices and uploading the latest products online. Let us help you expand your business and activities with an intuitive E-Commerce website! We Bring you Powerful E-Commerce Features to Transform your Business. Increase your chance to attract more customers and bring in sales. A one-click checkout process to increase sales and reduce cart abandonments. Offer your customers multiple options for paying for their basket. Simplifies managing and overseeing order fulfilment. Full safety and security on crucial customer data when transactions are made. We set up hosting, improving your website performance. Easily download purchase orders, customer data and product status. Keeps you and your customers informed about the order status. Want your business to get online and succeed? We're delighted to show our clients comments. We got our website designed by Design Direct. Quite helpful and co-operative team. But a little slow in responding to queries. could do better.. Otherwise they are good at what they are doing. Also we take SEO facilities through them and our online search ratings have improved a lot and we are getting online sales enquiries. Would recommend Design Direct for your web designing services. Without hestitate, I write to express my thanks to your team of professionals, who have designed the website for "The Latter-Rain Outpouring Revival Ministries". The result is that the website is one of complete delight with such ease and friendly links to navigate the site. The website is tailor-made at a affordable cost. I have no hesitation in recommending your services to others. I have been working with Design Direct full time for 3 years, currently they have built and maintained 2 software products plus websites as well as new logos, business support etc and they have been amazing the whole time. Excellent team and genuine good people. we are now starting a new venture and I have 100% trust that they will produce another excellent product. This website stores cookies on your computer. These cookies are used to collect information about how you interact with our website and allow us to remember you. We use this information in order to improve and customise your browsing experience and for analytics and metrics about our visitors both on this website and other media. To find out more about the cookies we use, see our Cookies Policy.